listed on the left menu. 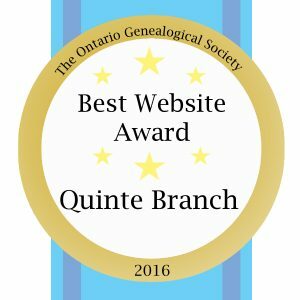 The Quinte Branch of the Ontario Genealogical Society (OGS) is a not-for-profit organization with over 300 members in the Quinte area and worldwide. The Bay of Quinte, covering Hastings, Prince Edward and southeastern Northumberland counties, was one of the first areas settled by United Empire Loyalists in 1784. The branch research library is located in the Quinte Genealogy Centre at the Quinte West Public Library in Trenton. There are several databases including the searchable online Names Index Finding Aid to assist researchers to locate specific resources in the library holdings that are steadily growing thanks to generous donations. Research can be carried out on-site during opening hours or research help is available from our volunteers through correspondence. Books, CDs and over 140 cemetery transcriptions from Hastings, Northumberland and Prince Edward counties are available for purchase by mail order. Meetings are held at a variety of venues nine times a year and visitors are always welcome. Our newsletter The Quinte Searchlight is published four times a year and contains feature articles of interest to all genealogists. 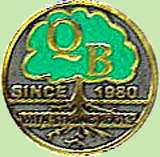 Membership in the branch is just $10.00 in addition to full membership in the OGS. New to genealogy? Check out Genealogy 101 and the Course Materials for some tips and tools to get started, then explore the Tool Kit Links and Genealogy Links that include websites that members find helpful for research in the Bay of Quinte area and beyond.